The ADuM41371 is a single-channel gate driver specifically optimized for driving insulated gate bipolar transistors (IGBTs). 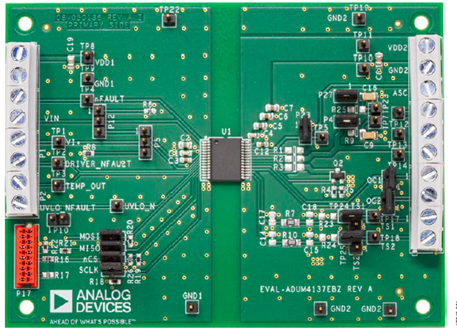 Analog Devices, Inc., iCoupler® technology provides isolation between the input signal and the output gate drive. The Analog Devices chip scale transformers also provide isolated communication of control information between the high voltage and low voltage domains of the chip. Information on the status of the chip can be read back from the dedicated fault outputs. The ADuM4137 provides isolated fault reporting for overcurrent events, remote temperature overheating events, undervoltage lockout (UVLO), and thermal shutdown (TSD). Integrated onto the ADuM4137 is an overcurrent detection feature that protects the IGBT in case of overcurrent events. The split emitter overcurrent detection is coupled with a high speed, two-level turn off in case of faults. The ADuM4137 provides a Miller clamp control signal for the external metal-oxide semiconductor field effect transistor (MOSFET) to provide robust IGBT turn off with a single rail supply when the gate voltage drops below 2.0 V (typical) and above GND2. Operation with unipolar secondary supplies is possible, with or without the Miller clamp operation. A low gate voltage detection circuit can trigger a fault if the gate voltage does not go above the internal threshold (VDVL) within the time allowed from turn on (tDVL). This circuit allows detection of IGBT device failures that exhibit gate shorts or other causes of weak drive. The secondary falling UVLO is set to 11.24 V (typical) for common IGBT two-level plateau voltage levels. 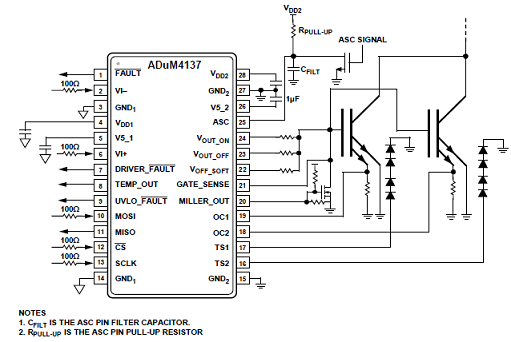 The ADuM4137 provides for in field programming of temperature. Two temperature sensor pins allow isolated monitoring of system temperatures at the IGBTs, sensing diode gains and offsets by means of a serial port interface (SPI) bus on the primary side of the device. Values are stored on an EEPROM located on the secondary side. Additionally, programming is available for specific voltage offsets, temperature sensing reporting frequencies, and important delays. The ASC pin on the secondary side on the ADuM4137 allows the driver to be switched on from the secondary side if no faults are present. The EVAL-ADuM4137EBZ board demonstrates the advanced features of the ADuM4137 while maintaining flexibility in a testing environment. The EVAL-ADuM4137EBZ board layout delivers a circuit that is easy to manipulate via jumper pins. A more optimized layout is possible and increases the performance of the system. The EVAL-ADuM4137EBZ board works with the USB-SDP-CABLEZ programming cable to access the secondary side electronically erasable programmable read only memory (EEPROM) and includes the option to drive the serial peripheral interface (SPI) bus with any other SPI compatible system. 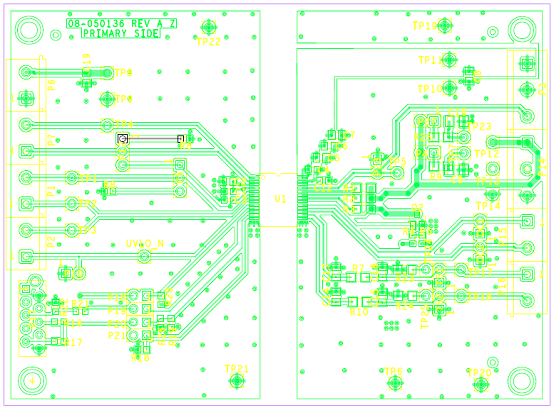 The USB-SDP-CABLEZ operates with a 3.3 V logic supply, while the ADuM4137 has an internal 5 V regulator. A resistor divider on the MISO line is included in the R21 and R22 resistors to allow interfacing. This guide demonstrates how to use the ADuM4137 evaluation software for accessing the user trim bits and explains how to simulate EEPROM settings and program bits into nonvolatile memory. 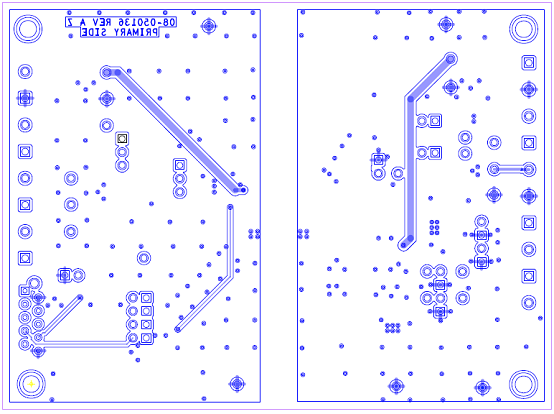 For full details on the ADuM4137, see the ADuM4137 data sheet, which should be consulted in conjunction with this user guide when using this evaluation board.